Could NASA send humans to Mars orbit by 2033 and onto the surface of the planet by 2039? The Planetary Society — a nongovernmental space advocacy group — has announced that it thinks this timeline is achievable. 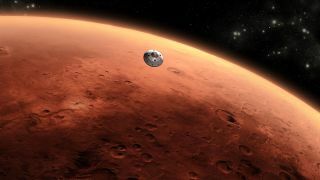 NASA could get astronauts to Mars orbit by 2033 and onto the Red Planet's surface by 2039, a new report by a nongovernmental organization suggests. At a news conference this morning (April 2), representatives of The Planetary Society presented the results of a workshop organized to discuss the feasibility and cost of a crewed mission to orbit the Martian moon Phobos in 2033, leading up to a crewed landing on the Red Planet in 2039. They concluded that such a plan could indeed fit within NASA's human space exploration budget. The Planetary Society is the largest nongovernmental space advocacy organization in the world, according to its website. In addition to Hubbard, two other science experts spoke at the event: Planetary Society CEO (and former TV "Science Guy") Bill Nye and John Logsdon, a professor emeritus at The George Washington University Space Policy Institute who is also a member of The Planetary Society's board of directors. The "Humans Orbiting Mars" workshop took place from March 31 to April 1 in Washington, D.C. The workshop's 70 attendees discussed the technical feasibility, affordability and benefits of a proposed schedule to get humans into orbit around Mars and eventually onto the planet's surface. That detailed plan was not created by The Planetary Society, but rather was proposed in a separate report co-created by NASA's Jet Propulsion Laboratory. In a statement, the society said the attendees of the workshop "reached a consensus" on a series of key points, including that an orbital mission would be required prior to a crewed mission to the surface of Mars, and an independent cost estimate showed that the program would fit into the NASA budget, assuming the agency "ends its lead role in the International Space Station." The panel emphasized the 2033 orbital mission as the crucial first step of the plan, comparing it to NASA's Apollo 8 mission, which took astronauts into orbit around the moon before humans landed on the satellite's surface. The Phobos orbital mission would last approximately 30 months, with nine months of travel each way and 12 months in orbit, the panelists said. Crewmembers would be able to study Phobos and Deimos, Mars' other moon, and potentially teleoperate rovers on the Martian surface. The panel said the current plan would use an Orion spacecraft to move crewmembers from Earth into orbit and back down. When asked what potential roadblocks this Mars program might face, all of the panelists stated that the largest hurdles were political, not technical. "I'm not saying the technical challenges aren't extraordinary and very, very difficult," Nye said. "And it's going to take a lot of thoughtful engineers and scientists giving it a lot of thought and science. But the real problem is politics — or the real opportunity is politics." The Planetary Society hosted a press event today (April 2, 2015) to discuss a plan for NASA sending humans to Mars. The event panelists were (from left): Planetary Society CEO Bill Nye, and Scott Hubbard and John Logsdon, both members of the society's board of directors. Logsdon said he thinks a decision on whether to adopt the plan is "an issue for the next president." Hubbard said that, in the past, Mars missions may have been limited by technological or scientific challenges, but that no longer appears to be the case. "In the past, when the question of humans to Mars came up, I would typically cite a number of major hurdles: biomedical, launch systems and so forth," he said. "And as of today, I think that those risks have either been reduced or you know how to minimize them, and so I am at the same place that John [Logsdon] and Bill [Nye] [are], that I think the issue now is […] political will."